Many thanks Einyodler a fine resource you have created here for us. The shop manual pdf for my bike has been invaluable. You can't make too much popcorn, but you can definately eat too much popcorn. To add to this thread, I was doing an image search on the CB650 and came across this site with the 1980 CB650 service manual for the European Direct Sales model. The quality is nice and I imagine that except for some trim and electrical differences, most of the manual is applicable to the US model. I wish the PDF's didn't have document security settings enabled, namely "Document Assembly" is not allowed. It would be nice to reassemble all 10 of the CB400F PDF's into one single PDF. I'm not being ungrateful, these are wicked sweet!! Thank you so much! Everything's coming up "site maintenance" for me. @Einyodeler, Great stuff! Thanks for the manuals. Did you know, pages 45 - 70 are missing from the CB750 Shop Manual? (Half of Group 3: Engine Mechanical, all of Group 4: Clutch, and all of Group 5: Transmission. Also, are Groups 13 - 19 in a separate .pdf? as are the supplements? It seems that the host server has been in the "site maintenance' mode for almost a week now. I can't seem to get the first 750 pdf. All the other ones d/l just fine though. Oh and thanks very much for putting these up. I was getting frusturated with my Clymer manual. 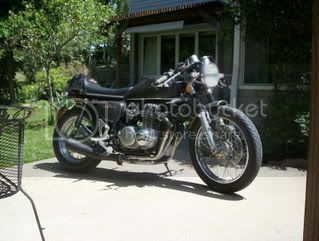 Does any one have a copy of a 1978 Honda CB400T1 manual? I would gladly scan it for you and give you a dvd copy of it if I can have a look at it. I have added a lot more manuals this past week. If you couldn`t find what you were looking for earlier, check out the list now. All of the SOHC4 downloads are working now as well as the others. Was there ever a K0 parts manual? I have not been able to find one, always use the parts distributors' online ones but would love to find one. Check at CMSL. I bought one from them about 3 years ago (it's a very good copy). It was around $35 as I recall and covers the CB750 (aka K0), K1, K2 and CB750P (police model). The exploded diagrams alone have been worth the $$, let alone being able to order parts, but many sites have the diagrams on-line for ordering parts now. I`ve got the early `80`s GSX 1100 service manual ready for downloading,more or less same bike with more displacement. I`ll let you know when I find the gsx750 manual. Some Triumph and Ducati manuals are also ready,I know we have quite a few Ducatisti and Triumph riders on here. Triumph Sprint 955i 99-04 Stefan? Borrowed the Triumph factory manual from my local dealer. I have it scanned and will be hosting it via Bikers Oracle when they give me upload access. If anyone wants a CD, give me a PM. Thanks for the valuable service! I noticed that the manual you label 500/550 is just labeled as a cb500 manual in the pdf. Is there a cb550 specific manual out there? Are there differences between the 500/550 that I should be concerned about? For those that are having problems opening some of these files: I noticed that the files were created in Acrobat version 6 and 7. The files created in version 7 have been password protected to keep them from being modified or extracted. They will open using Acrobat version 6 (with the error notice). For those complaining about PW protection. There are ways around that . I'm not sure why PW protection is required, as these are scans. This first one is a MUST download, no matter which model you have. It contains a vast amount of general maintenance data and procedures not covered in the Shop Manuals. Some of these files are huge so if you have any problems downloading due to having a slow dial-up modem and need manuals, just send me an e-mail at einyodeler@netscape.net with the list of manuals wanted and I can send you a CD. My suggestion is to go to the mediafire download page, then right-click the "Clic Here to Start Download" link then select Save As and save the PDFs to your hard drive. I recently went through and downloaded most of these, only one link failed to work (think it was part 1 of the 500T shop manual). here are a few more i have posted.